You will have noticed that I have not written to you since the recording of Entangled States in January. Unfortunately the process from recording to release is complex and takes a long time. It’s happening, but at a rate comparable to that of tectonic shift. I have been writing, placing marks of graphite and graphene onto paper. I have been searching for another Big Idea but that is proving to be irritatingly elusive. I am pursuing my thread of simplicity in music – much music has too many notes. I have alluded to this in previous posts and have decided to combine this way of working with a project that has been percolating for many years, to write Pieces for Terrible Pianists. I will explain in a further post, but not now. 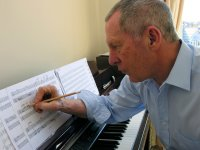 So, I have decided to write about an episode which happened in another chapter in my life,a life far removed from my present arcane world of composing. December 6th in a former life. A wet, grey, cold, flat, forbidding Middleton Sands. The Lune Estuary. Morecambe Bay. North West England. A solitary, tiny, frail, flexwing microlight flying machine. 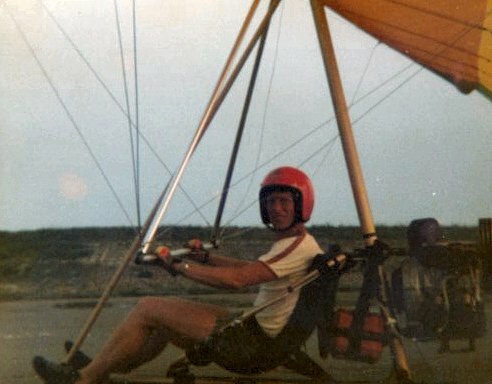 A combination of a Striker wing and a Mainair Tripacer Trike had been trailored 60 miles from Manchester and was waiting to be flown,was rigged, fully fuelled, checked. I was here on the beach with one thought in my head, to climb to 10,000 feet, higher than I had ever flown and at that altitude to cut the engine and to glide down to my take-off point, a line scoured in the sand. There was just one problem the area was covered, shrouded by a persistent blanket of adiabatic fog. The hours were passing. The short winter day was already beginning to close. I had stomped along the shore in an effort to keep warm and was beginning to think of abandoning my plans when the layer of fog began to noticeably thin. My instincts were to try, to go for it, to seize this opportunity. Pre-flight checks again, engine started, warmed. I strapped myself in and applied full throttle. The take off run was extended due to a nil wind and a wet clinging surface.Lift off. Bar out. Climbing steeply, feet level with my chest. Within seconds I had punched through a very thin layer of fog and settled myself for a long ascent. There was minimal instrumentation available. I had an altimeter strapped to my left wrist and a compass tied with a piece of string to an angle of the A frame. That was the avionics accounted for. 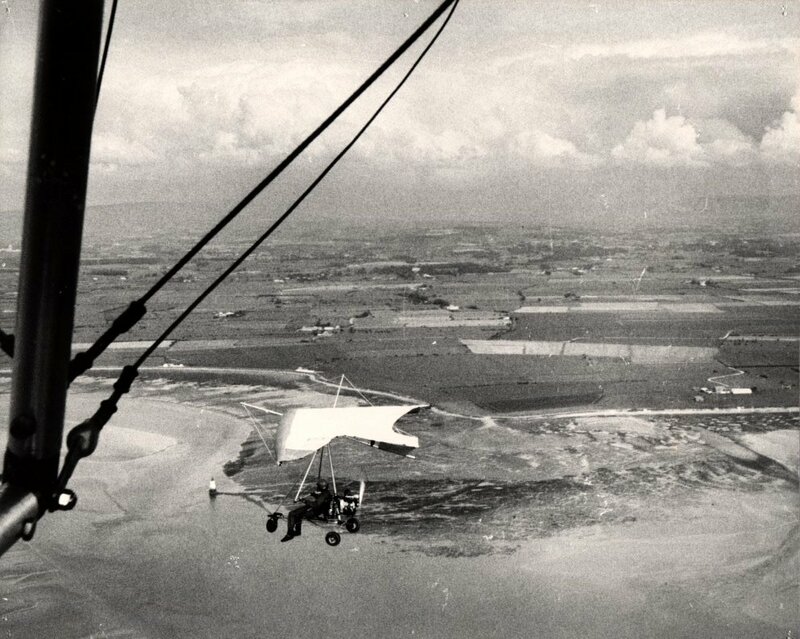 Everything was minimal in those very early days of microlight development. The trike was comprised of a few aluminium poles describing triangles. The sail was a barely modified hang glider wing. This form of aviation was in its infancy. Dangling my legs 2000 ft above the Lune Estuary. As the altimeter ticked around, first the Lune Estury, then Morecambe Bay, then the hills of the Lake District fell into their expected positions. The engine, a Rotax 330cc twin cylinder 2 stroke continued to supply sufficient power for the altitude to slowly increase. That was quite important as, at the time, the engines were inverted, which sometimes gave rise to plug fouling which, in turn gave way to unscheduled landings. On one such occasion, I was forced to land in a field by the side of the M6 motorway near Preston. It proved to be a field with a slope. Braking was achieved by taking feet off the steering bar and digging them as forcibly as possible into the ground. Brakes were a thing of the future. I always carried a toolkit – in those days it was necessary – and after securing the aircraft and leaving the engine to cool, I began to take out and clean the plugs. A passing police car pulled to a halt on the hard shoulder of the motorway and the officer climbed over fence and field and approached me in a most friendly manner. He asked me what the problem was and, after I had explained, he volunteered to drive to a motorway service station, purchase two plugs and to return, which he did within a very short time. He refused to take any money from me and remained to see that I took off safely or perhaps to see if this machine could actually fly. To return to the ascent. I had passed through 8500 feet. The climb rate was slowly decreasing but something wonderful was happening. As my elevation increased the sun appeared, a huge, soft, orange circle framed by a wonderfully blue sky, the hills of the Lake District offering a black silhouette. I was by now no longer counting in thousands of feet, but in hundreds of feet. My altimeter slowly approaching my target. For some reason, once I was there, I added a few more feet before reaching down to a small switch between my legs and flipping it from right to left. It isn’t always December. Taxiing for a play amidst the summer cumulus in G-MBWP. The engine cut. The resulting silence was emphasised by the sudden lack of noise from an engine situated close behind me which had been on a continuous 90 per cent throttle. The powered craft became a glider. Virtual silence, air gently wafting through the wires, the wing beautifully responsive to any input. I had taken care to stay vertically above my take off point so my descent became an exhilarating series of spirals, figures of eights, dives and swoops. The air was still flat calm, brushing against my face. My feet were cocooned in insulated boots, my hands kept warm with three pairs of gloves. Almost immediately the sun disappeared and my eyes had to adjust, work harder. Looking down I saw that the layer of fog had completely disappeared and I was able to spot my landing site from 5 or 6 thousand feet. My environment was incredibly quiet, peaceful, serene, private. I landed and came to a rapid halt a few feet away from etched line. It was not necessary to switch the engine off after this particular flight.It had been switched off for almost twenty minutes. I parked the little machine into wind and climbed out, turned around and looked with a new sense of affiliation and affection at my tiny bundle of sticks and sail and the little two stroke which, at that time, was not intended for any purpose of aviation. By the time I had derigged, folded, packed the wing and tied the trike securely onto its trailer, night had fallen upon Morecambe Bay.